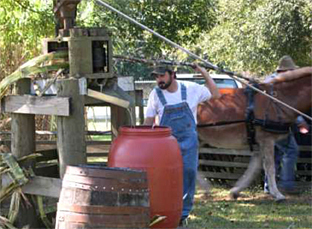 The Museum has hosted a traditional cane syrup making demonstrations, making syrup the old fashioned way. 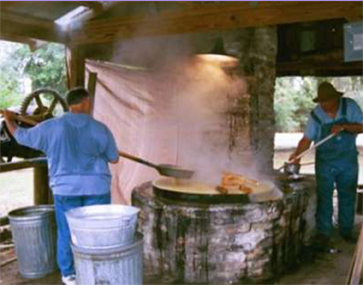 Using a technique that has been practiced for several hundred years, volunteers grind sugar cane into juice using a mule or tractor powered mill and then boil the juice into cane syrup. The process takes approximately six hours to complete with four of those hours reserved for the cooking process. Once completed, the syrup is then for sale in the Museum’s gift shop as a fundraiser. Cane syrup was a staple of the pioneer’s diet and remains a favorite among life long residents of the South. Charlie Kirksey, the head of the Museum’s syrup operation, says that “eighty gallons of juice will make eight to ten gallons of syrup”. Kirksey is also quick to point out that the Museum’s syrup mill is home to several examples of early grinders and a cooking kettle that dates back to the Civil War. He also says that he and other volunteers are “dedicated to preserving this old time method”. Head on out to the Museum and experience this unique process. There has been a syrup tasting contest with more than two dozen syrup-makers from around the state bringing in their samples to be judged on taste, color, pour, and clarity. Special events feature garden tractor pull in the early afternoon, hand-made crafts, and traditional musicians. The concession stand will be open with syrup-sopping biscuits as well as pulled pork sandwiches. The Pioneer Florida Museum is a nonprofit organization dedicated to preserving Florida’s pioneer heritage. The museum is open Tuesday through Saturday 10 am to 5 pm. The museum is located one mile north of downtown Dade City, off of US 301 at15602 Pioneer Museum Road.